2 The Globe Theatre Size and Shape Opened in 1599; Shakespeare's company regularly performed there. Opened in 1599; Shakespeare's company regularly performed there. Polygonal shape with as many as 20 sides. Polygonal shape with as many as 20 sides. 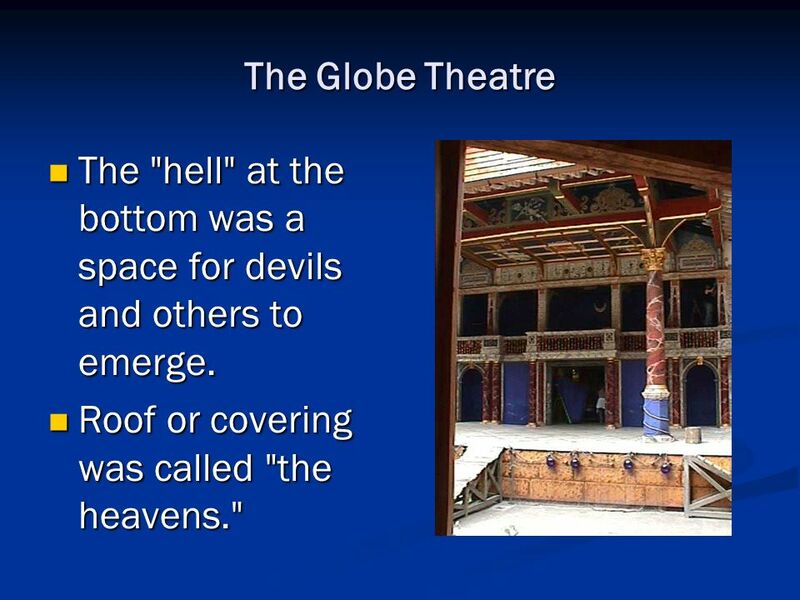 3 The Globe Theatre The "hell" at the bottom was a space for devils and others to emerge. The "hell" at the bottom was a space for devils and others to emerge. Roof or covering was called "the heavens." Roof or covering was called "the heavens." 4 The Globe Theatre Yard of the Globe was 80' in diameter; held 800 spectators. 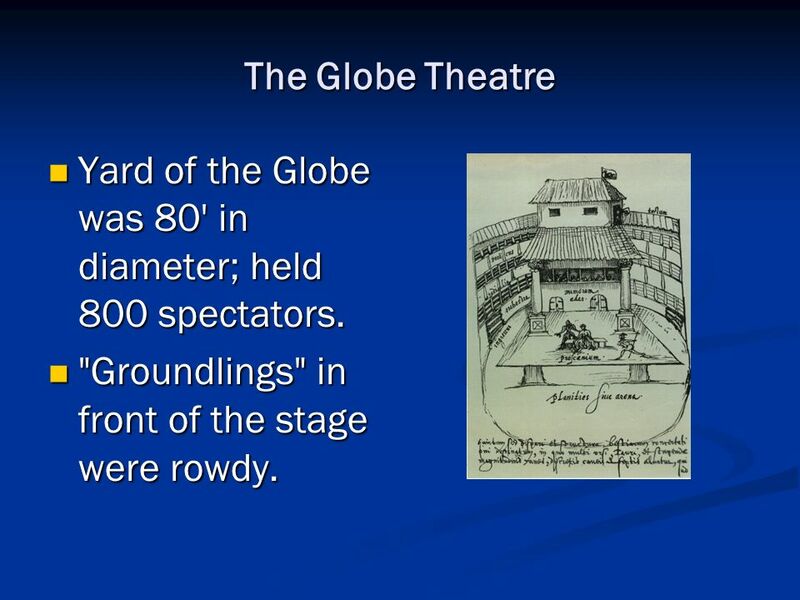 Yard of the Globe was 80' in diameter; held 800 spectators. "Groundlings" in front of the stage were rowdy. "Groundlings" in front of the stage were rowdy. 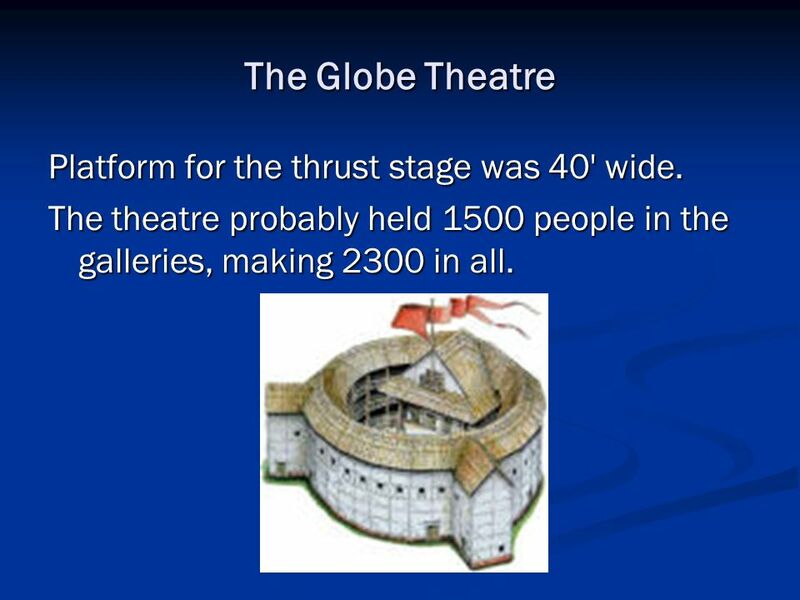 5 The Globe Theatre Platform for the thrust stage was 40' wide. The theatre probably held 1500 people in the galleries, making 2300 in all. 6 Performances The players were all men; the women's parts were played by boys. 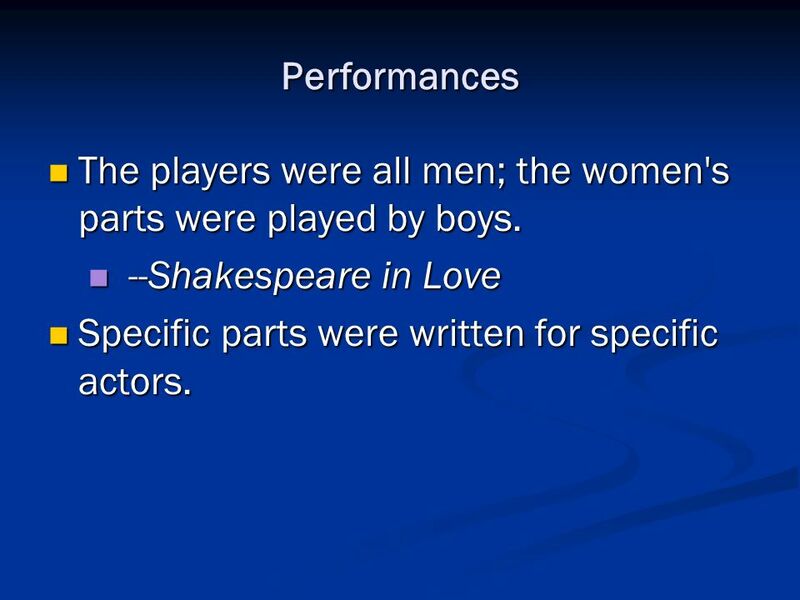 The players were all men; the women's parts were played by boys. --Shakespeare in Love --Shakespeare in Love Specific parts were written for specific actors. Specific parts were written for specific actors. 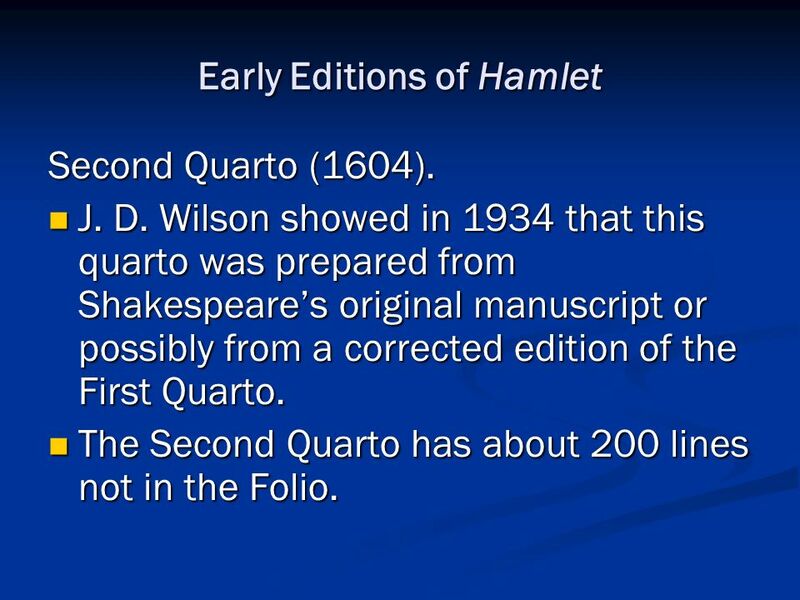 8 Early Editions of Hamlet First Quarto (1603) For Hamlet, the First Quarto presents a "bad" or memorially reconstructed text. 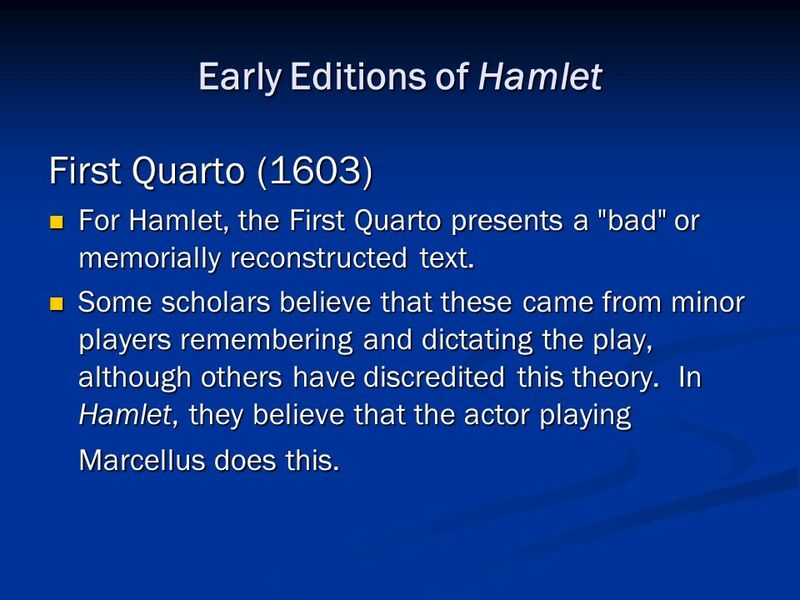 For Hamlet, the First Quarto presents a "bad" or memorially reconstructed text. Some scholars believe that these came from minor players remembering and dictating the play, although others have discredited this theory. In Hamlet, they believe that the actor playing Marcellus does this. Some scholars believe that these came from minor players remembering and dictating the play, although others have discredited this theory. In Hamlet, they believe that the actor playing Marcellus does this. 9 Early Editions of Hamlet The First Quarto text of Hamlet presents a much more sympathetic vision of Gertrude; she swears to assist Hamlet in his revenge, for example. 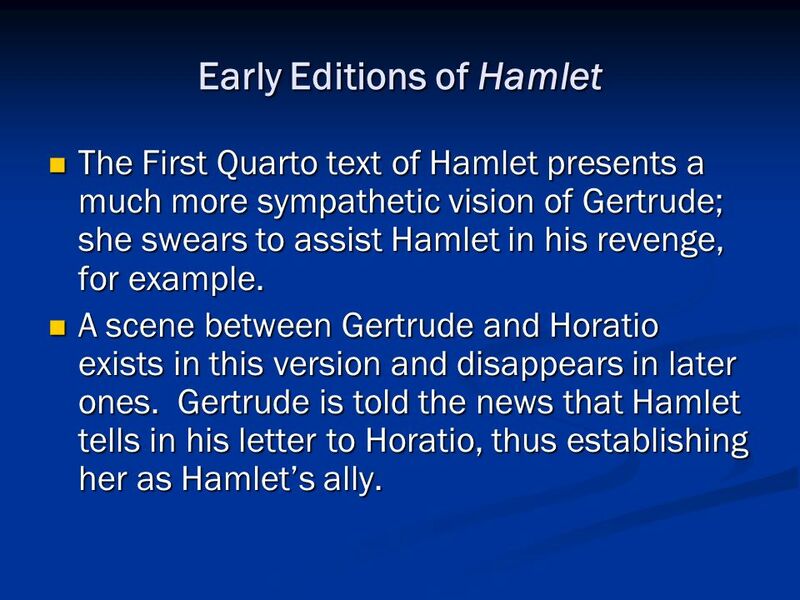 The First Quarto text of Hamlet presents a much more sympathetic vision of Gertrude; she swears to assist Hamlet in his revenge, for example. A scene between Gertrude and Horatio exists in this version and disappears in later ones. Gertrude is told the news that Hamlet tells in his letter to Horatio, thus establishing her as Hamlets ally. A scene between Gertrude and Horatio exists in this version and disappears in later ones. Gertrude is told the news that Hamlet tells in his letter to Horatio, thus establishing her as Hamlets ally. 10 Early Editions of Hamlet Second Quarto (1604). J. D. Wilson showed in 1934 that this quarto was prepared from Shakespeares original manuscript or possibly from a corrected edition of the First Quarto. J. D. Wilson showed in 1934 that this quarto was prepared from Shakespeares original manuscript or possibly from a corrected edition of the First Quarto. The Second Quarto has about 200 lines not in the Folio. The Second Quarto has about 200 lines not in the Folio. 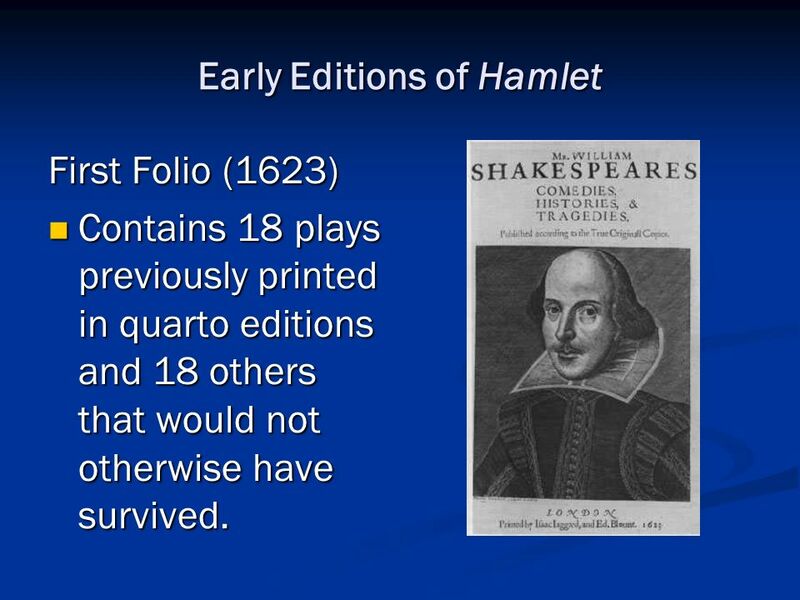 11 Early Editions of Hamlet First Folio (1623) Contains 18 plays previously printed in quarto editions and 18 others that would not otherwise have survived. Contains 18 plays previously printed in quarto editions and 18 others that would not otherwise have survived. 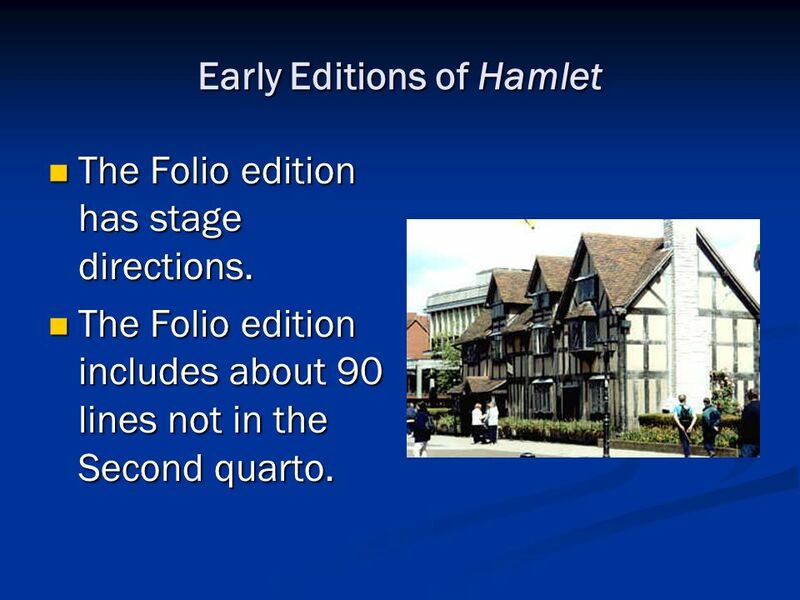 12 Early Editions of Hamlet The Folio edition has stage directions. The Folio edition has stage directions. The Folio edition includes about 90 lines not in the Second quarto. 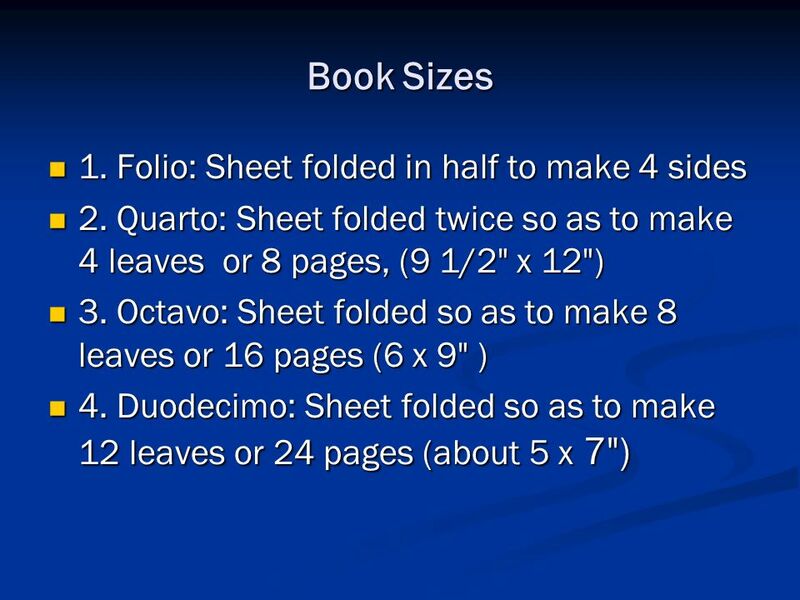 The Folio edition includes about 90 lines not in the Second quarto. 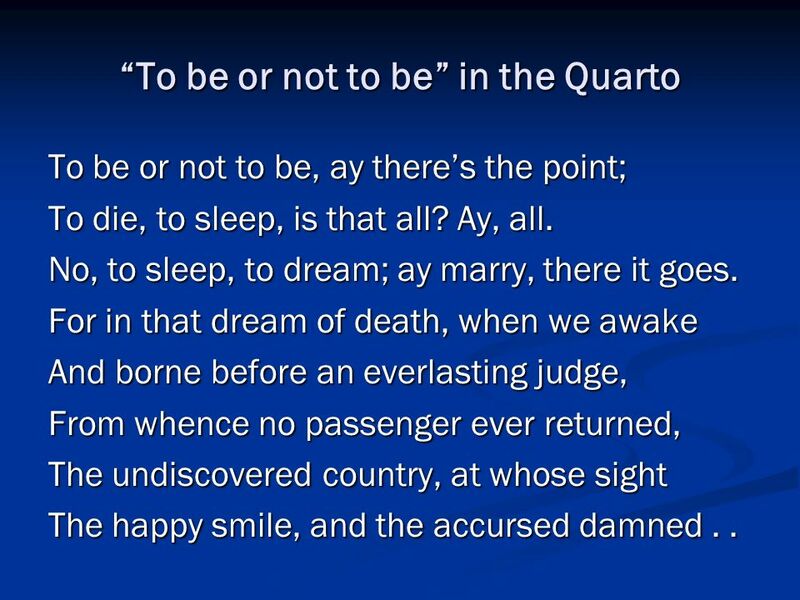 14 To be or not to be in the Quarto To be or not to be, ay theres the point; To die, to sleep, is that all? Ay, all. No, to sleep, to dream; ay marry, there it goes. For in that dream of death, when we awake And borne before an everlasting judge, From whence no passenger ever returned, The undiscovered country, at whose sight The happy smile, and the accursed damned..
17 Sources Shakespeare also may have used volume 5 (1570) of Histoires tragiques, a free translation of Saxo by François de Belleforest. 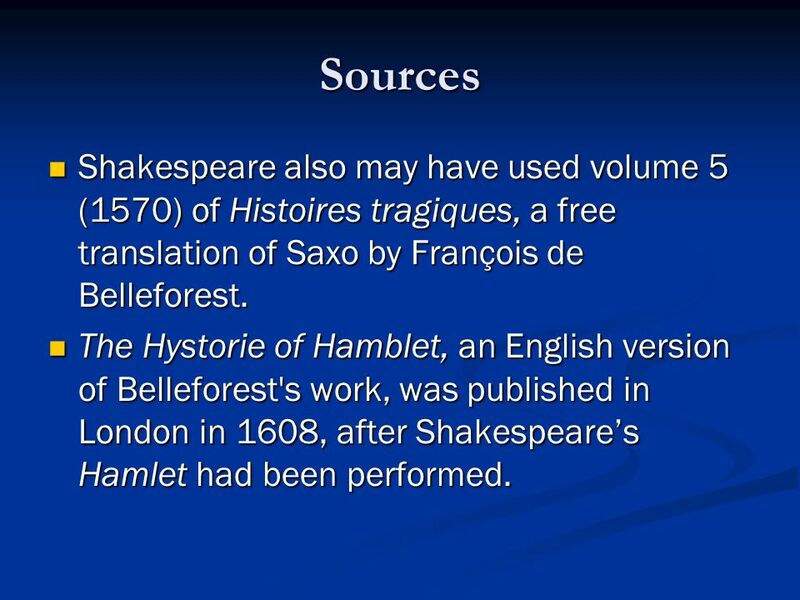 Shakespeare also may have used volume 5 (1570) of Histoires tragiques, a free translation of Saxo by François de Belleforest. 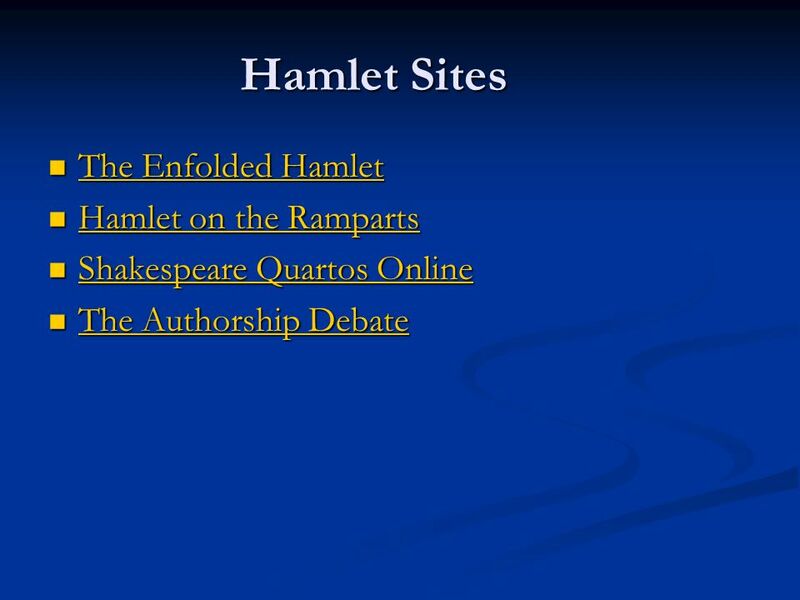 The Hystorie of Hamblet, an English version of Belleforest's work, was published in London in 1608, after Shakespeares Hamlet had been performed. 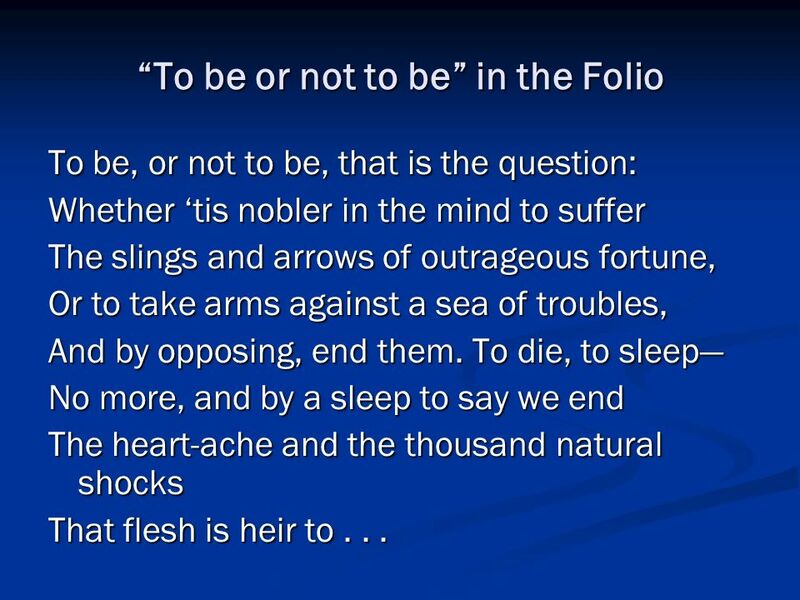 The Hystorie of Hamblet, an English version of Belleforest's work, was published in London in 1608, after Shakespeares Hamlet had been performed. 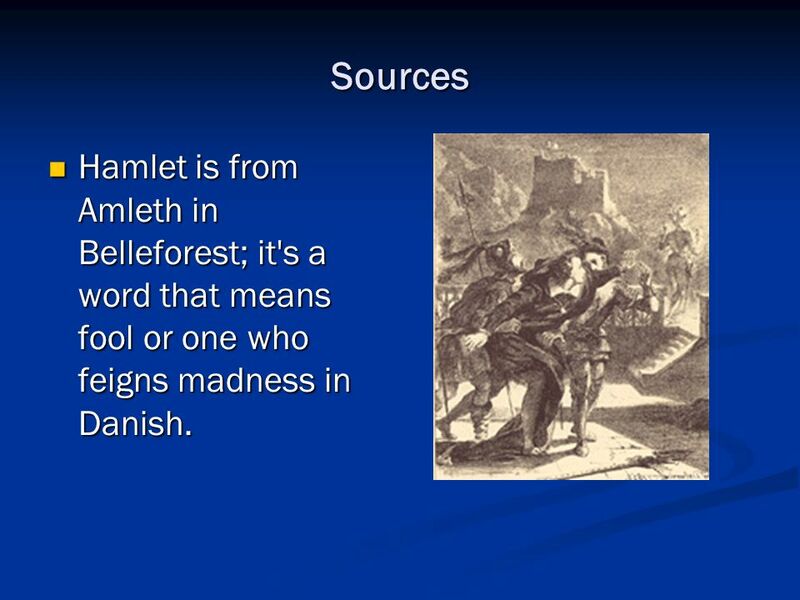 18 Sources Hamlet is from Amleth in Belleforest; it's a word that means fool or one who feigns madness in Danish. Hamlet is from Amleth in Belleforest; it's a word that means fool or one who feigns madness in Danish. 19 Sources In the original, Amleth feigns madness to keep away from his murderous uncle. 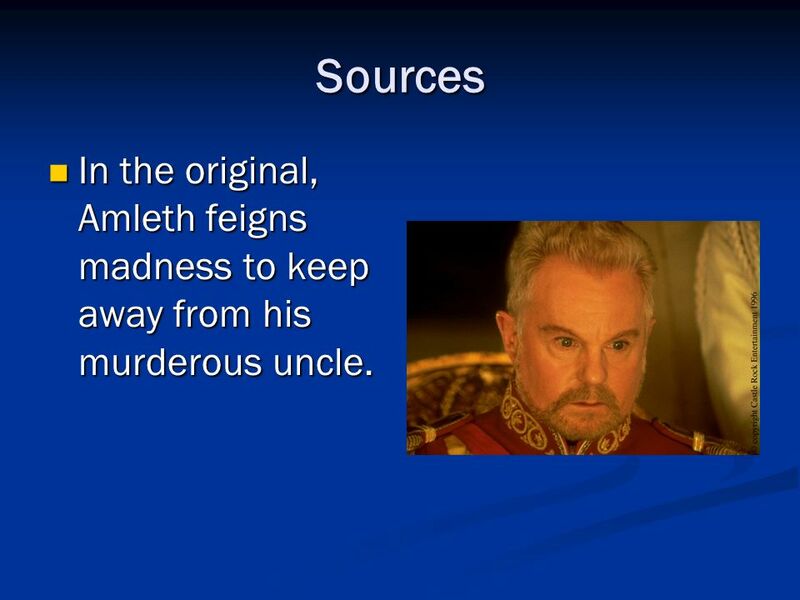 In the original, Amleth feigns madness to keep away from his murderous uncle. 20 Sources The ghost in the original play by Belleforest said "Hamlet! Revenge!" frequently, which must have been a joke by the time of the Hamlet. 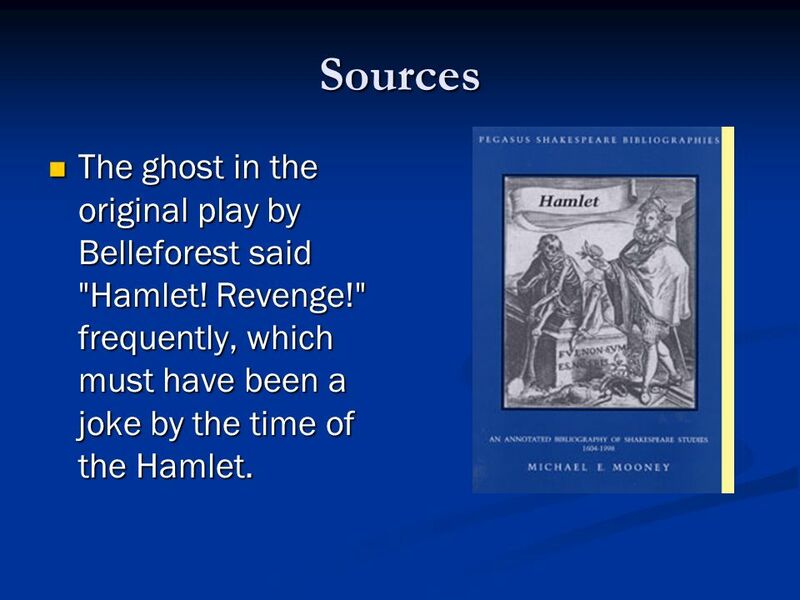 The ghost in the original play by Belleforest said "Hamlet! Revenge!" frequently, which must have been a joke by the time of the Hamlet. 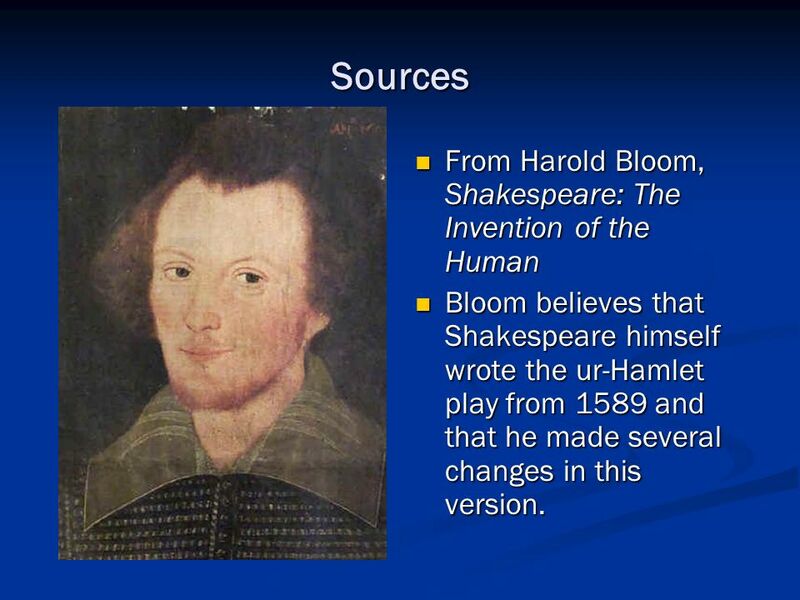 21 Sources From Harold Bloom, Shakespeare: The Invention of the Human Bloom believes that Shakespeare himself wrote the ur-Hamlet play from 1589 and that he made several changes in this version. 22 Sources The Ghost (which Shakespeare probably played) is less prominent in the version of Hamlet that we know. 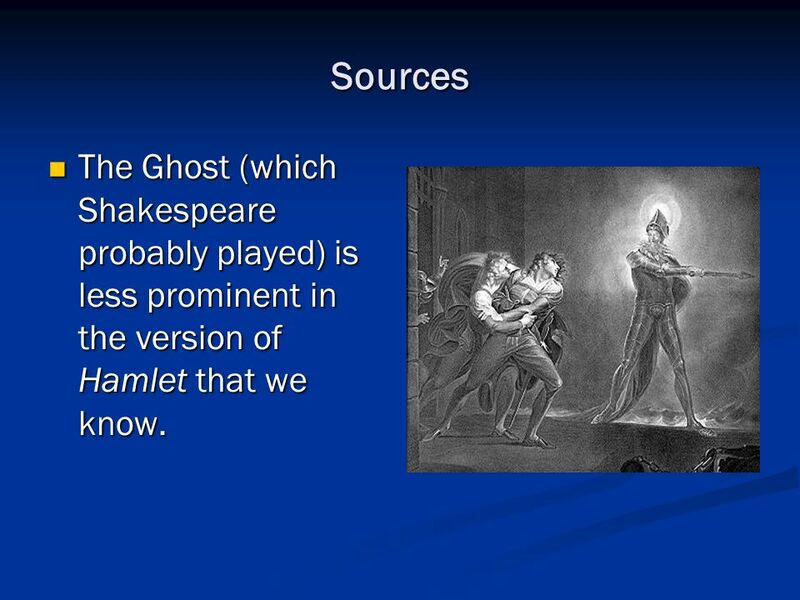 The Ghost (which Shakespeare probably played) is less prominent in the version of Hamlet that we know. 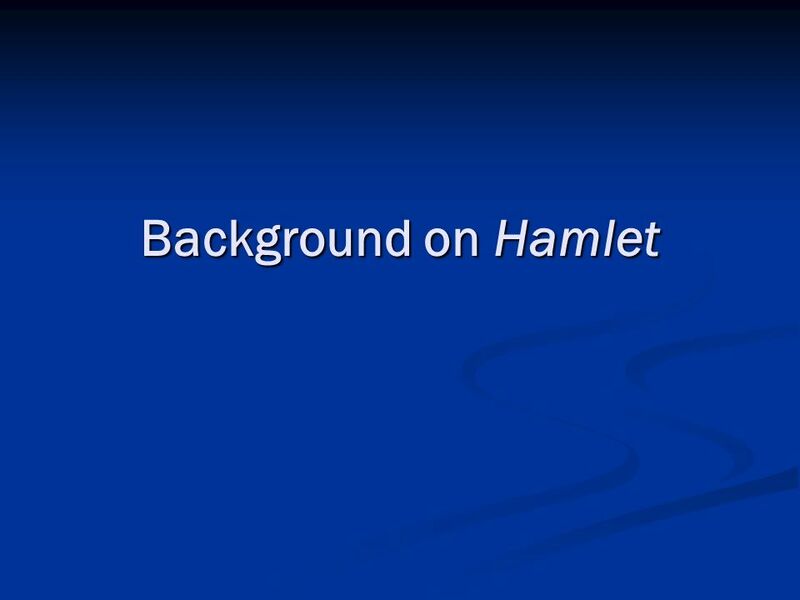 Download ppt "Background on Hamlet. 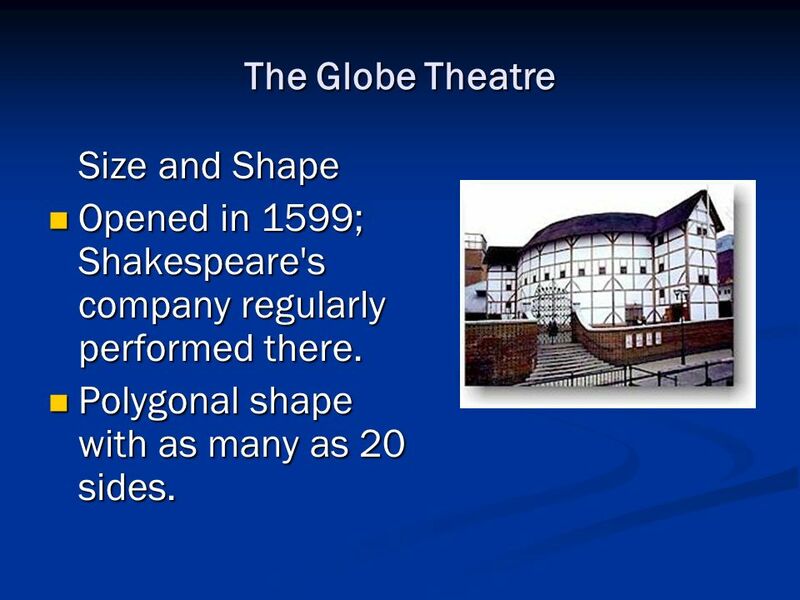 The Globe Theatre Size and Shape Opened in 1599; Shakespeare's company regularly performed there. Opened in 1599; Shakespeare's." Hamlet The Prince of Denmark. fascinating facts Hamlet--fascinating facts Willies most popular play The longest of Shakespeares plays (when performed. William Shakespeare. The actual date of Shakespeare's birth is not known, but, traditionally, April 23, St George's Day, has been Shakespeare's accepted. 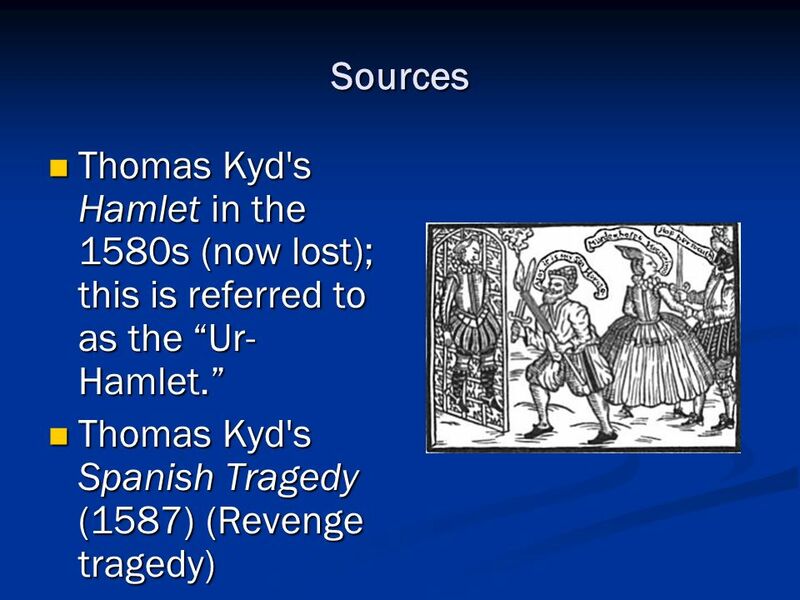 William Shakespeare A basic introduction to Shakespeare's play: Hamlet. Hamlet Act Three. Scene One  Rosencrantz and Guildenstern tell Claudius and Gertrude that Hamlet will not tell them why he has lost interest in everything. William Shakespeare  The story of Hamlet was well over 700 years old at the time that Shakespeare wrote it. 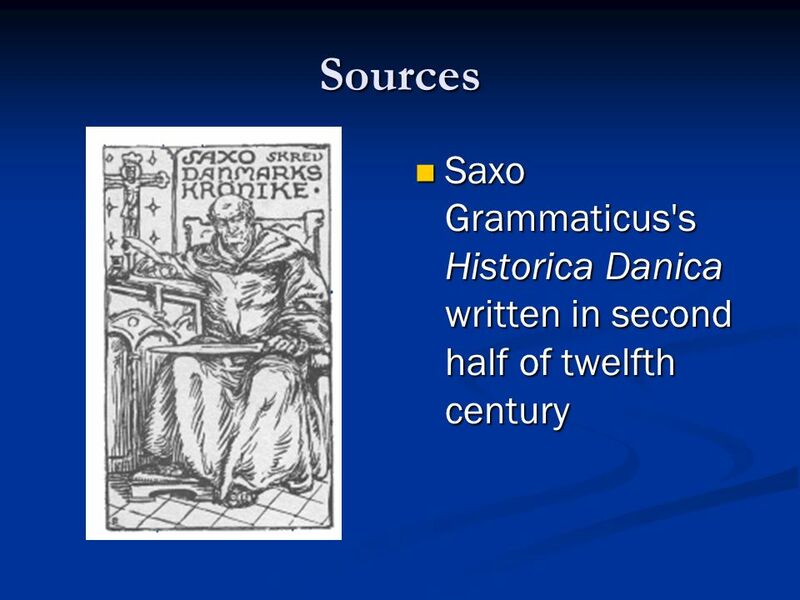 It first appeared in Historia Danica. Shakespeare! or, The Man Who Talks Funny Tangerine Tigers English Mr. Wong Room 1132. Shakespeare Di Bugli Alessia. Shakespeare’s life Shakespeare was born in 1564 in Stratford-upon-Avon in England. He married when he was 18 years with.  A very difficult play to date  It was entered in the Stationers’ Register in July 1602, and printed in quarto form in 1603 as The Tragical History.